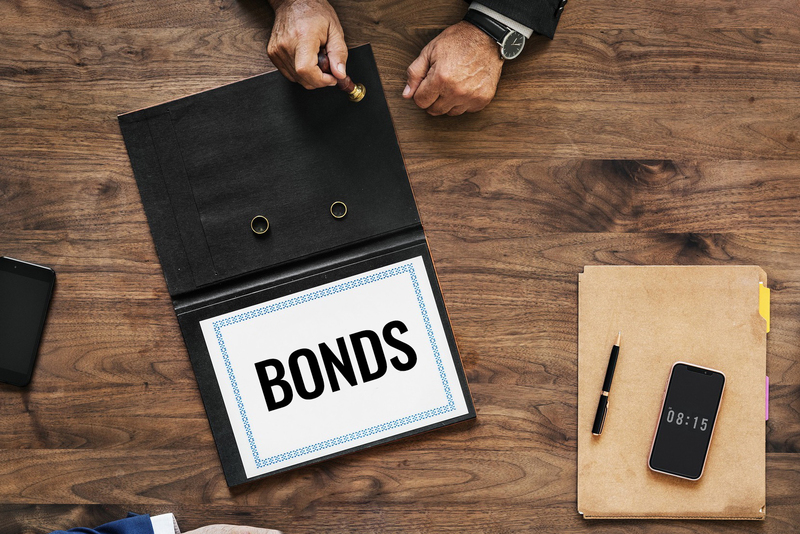 Besides stocks, real estate and bank deposits, bonds have always been one of the traditional asset classes that investors might consider including in their investment portfolios. Bonds represent debt obligations issued by organisations and companies to investors. Investing in a bond means owning the debt of a bond issuer. A bond issuer will make interest payments at regular intervals to you, the investor, until the maturity of the bond, where the issuer is legally obliged to return the principal. In the past, bonds were not readily available in Singapore for retail investors due to the high minimum investment sum usually required. However, over the past decade, there have been an increasing number of bond issues targeting retail investors. With more options available, Singapore retail investors can now include bonds in their investment portfolio. But how can someone start investing in bonds? Before you start investing in bonds, you first need to know what are some of the most common types of bonds that you can invest in. These are bonds issued by the Singapore Government. They include treasury-bills (T-bills), SGS Bonds and Singapore Savings Bonds (SSB). These bonds are backed by the Singapore government and can be regarded as risk-free. Corporate bonds are bonds issued by corporate entities. Unlike the SGS, corporate bonds can significantly vary in its riskiness, depending on the corporate entities that issue them. Typically, the risk of these corporate bonds can be determined through an analysis of the company’s financial in order for investors to find out how well a company can service its bond obligations. Some investors may also rely on the bond’s credit rating (if any) to determine how risky a bond is. If two bonds are paying the same interest rate, a savvy investor will naturally choose the company which has stronger fundamentals. As such, entities that issue bonds which are deemed to be riskier may need to offer higher interest rates to attract investors. Of course, even the safest bonds issued by the best companies today may deteriorate in quality over time. That’s because corporate entities operate in an ever-changing business environment. A highly profitable company today may become less profitable or even loss-making in the future. This will, in turn, affect the quality of its bonds. An investor can invest into a basket of bonds through a bond ETF. The beauty of investing in a bond ETF is that you enjoy a diversified portfolio of bonds without having to ever buy one directly or considering reinvesting cash flows from expiring bonds. The ABF Singapore Bond Index Fund is one such bond ETF listed on the Singapore Exchange (SGX). Managed by Nikko Asset Management, this ETF invests in high-quality bonds issued by the Singapore government and quasi-Singapore government entities. 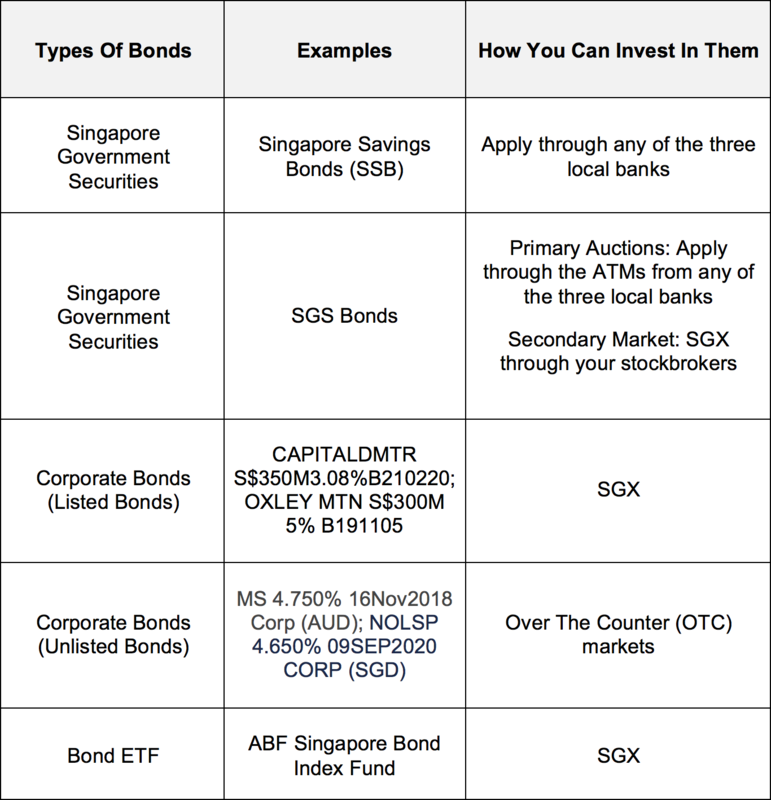 Once you understand the different types of bonds available in Singapore, you can consider investing in one or more. Some investors have the perception that bonds are an inaccessible asset class for retail investors. This is not true. Even from as little as a few hundred dollars, investors can start investing in some bonds in Singapore. The bonds listed above are available for all retail investors to purchase. There are also some bonds which are only available for accredited investors. An example of such a bond is the Astrea III PE Bonds, the first publicly-listed private equity bond in Singapore. The Astrea III PE bond is backed by cashflows from a diversified portfolio of private equity funds that subsidiaries of Astrea III have invested into. Astrea III’s parent company, Azalea Asset Management Pte. Ltd., is a wholly-owned subsidiary of Temasek Holdings (Private) Limited. The Astrea III PE bond was launched on the SGX in July 2016 and its Class A-1 bonds enjoys a rating of “A+sf” and “A+ (sf)” by rating agencies Fitch and S&P respectively. * Credit ratings companies use the indicator “sf” for “Structured Finance” instruments. The “sf” prefix does not change the definition of the ratings. Read Also: What Does It Mean To Be An Accredited Investor In Singapore? Before you invest into some of these bonds, you should consider answering these three questions first. Unlike investing in stocks or properties, most bonds have a finite lifespan. This is also known as its maturity. Ideally, the maturity of a bond that you invest in should be aligned with your own investment horizon. For example, if you need to use the money that you’ve invested in five years’ time, it makes sense for you to invest in a bond that matures within five years, as opposed to the one that matures in 20 years. Unlike stocks that can easily be bought and sold on the exchange, bonds tend to be less liquid. Hence, before you invest into a bond, you should look at the liquidity of the bond to see if this could be an issue in the future if you need to sell it off urgently. For some bonds such as the Singapore Savings Bonds, liquidity is not an issue as the government have already guaranteed that your bond investment can be redeemed at any point in time with its principal guaranteed. For listed and unlisted corporate bonds, you can sell your bonds through the exchange that the bonds are listed in and OTC markets respectively. However, there is no guarantee that you will be able to receive the full investment amount, since the value of the bond may fluctuate depending on market conditions. In addition, similar to stocks, bonds can only be sold on the exchange if there are other buyers who are willing to buy them. Some investors are attracted to bonds because they perceive it to be less risky. This statement is not completely true. Bonds are typically less risky compared to stocks only if we are comparing them with regards to the same issuing company. For example, if we were to compare between the stocks and bonds issued by DBS, then it’s fair to say that the bonds issued are likely to be less risky. That’s because in a liquidation, bondholders will have senior claims to the company’s assets over its shareholders. However, if we are comparing between the stocks of one company to the bonds of another company that is of lower quality and at higher risk of default, this may not necessarily be true. When you take higher risk by investing into the bonds of a company with weaker fundamentals, you should naturally expect higher returns. As an investor, you need to consider your risk tolerance level before you invest in a bond, rather than automatically assume that all bonds are safe and as a result, invest into the bonds that give you the highest return, and which are also very likely to be the riskiest. A well-constructed portfolio should include both stocks and bonds. Stocks offer volatility that allows investors to quickly increase the value of their portfolio during good times. On the other hand, bonds which tends to be less volatile, and are able to offer stability during bad times while still delivering good value through regular interest payments. By having the right allocation of bonds in their portfolio, an investor will be able to enjoy the best of both worlds.